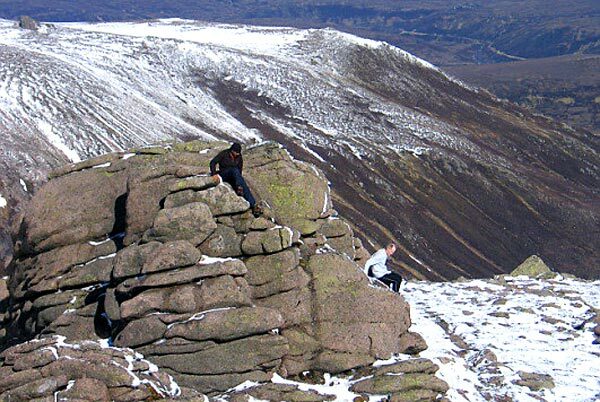 Leabaidh an Daimh Bhuide is the highest top on Ben Avon, which is a very large and complex mountain sprawling over more than 30 square kilometers. 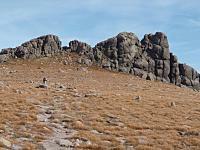 The summit plateau is dominated by granite tors, one of which forms the summit, but it is an easy scramble. 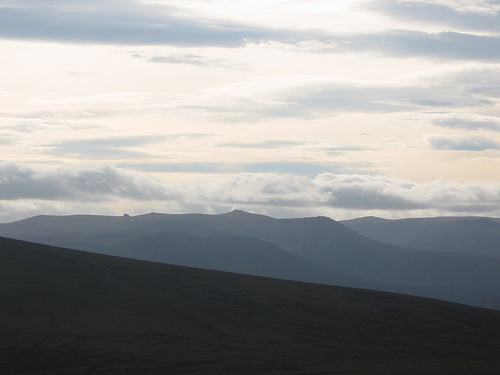 From the broad summit plateau, ridges lead in almost every direction, allowing access from Tomintoul to the N via Glen Avon, from Beinn a' Bhuird to the W and from Gleann an t-Slugain in the S. To the E of the summit lies the massive Garbh Choire with its rocky cliffs and the routes from the S and W take you close to corrie rim. Bizarre wooden elephant near one of the tops of Beinn a' Bhuird, with Ben Avon in the background. 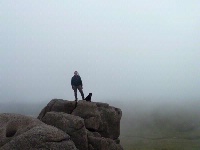 Leabaidh an Daimh Bhuidhe: messing about on the summit tor. May 18th 2005. 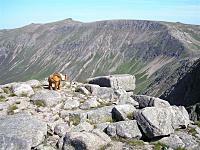 The summary information of one or more ascent routes that include Leabaidh an Daimh Bhuide. 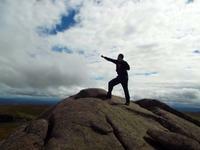 1 1437 m 33.50 km 9.5 hrs Leabaidh an Daimh Bhuide A long route on moderate slopes. 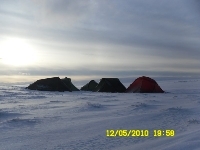 Route on summit plateau is on southern rim of steep cliff,, therefore, careful navigation required particularly in poor visibility. Post a few words about Leabaidh an Daimh Bhuide or read what others have had to say. Car Park is now up to £2.50 per day. The path now extends beyond the waypoint at NO11289903 (near Clach a' Cleirich) to avoid erosion, and does a zigzag via NO11189917 before returning to the northerly path. 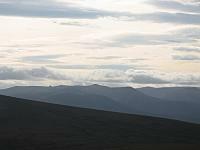 Biked about 1km past Slugain ruin to the split in the path and climbed Ben Avon before circling around to Beinn a'Bhuird. All the tops in cloud unfortunately. Quoich water quite high, but just managed to cross without getting feet wet. The point where the paths split off if you are going clockwise is not very obvious. Invercauld estate now built car park and toilet at Keiloch - costs £2 to use - excellent facility and good to see plenty of evidence of spending proceeds on paths as stated. 2nd visit my 100th munro first time around accompanying John this time.Cigar and brandy coffee to celebrate in lea of the wind after tor surfing on the summit. superb day out.